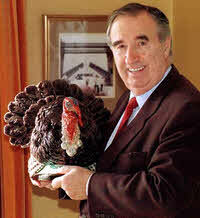 Bernard Matthews, the turkey farmer who was seemingly never off our TV screens in the 80s (on the adverts anyway) has passed away. He died on November 25th 2010, aged 80, which if he had been an American would have been a very ironic date to die, given that it was the date for Thanksgiving Day this year. Appearing in most of the television adverts for his company during the Eighties, Bernard Matthews was a bit of icon for the decade, appearing normally in a tweed jacket and always uttering his much repeated catchphrase, Bootiful. He has been credited with making turkey a more affordable meat for the average family, both in terms of whole frozen turkeys and in processed forms such as Turkey Burgers, Drummers and the dreaded (by Jamie Oliver at least) Turkey Twizzler. The seeds of his turkey empire were sown back in the late 1940s, when he bought an incubator and some turkey eggs and set about trying to start a turkey farm in his mother-in-laws garden. Ultimately this failed, but in 1950 he tried again in his spare time, whilst working as an insurance clerk. This time things went better, and he soon bought the run down Great Witchingham Hall, and used most of the rooms of the great house to raise (and slaughter) the turkeys! Whilst Bernard may not have appeared in his companies TV adverts for many years now, somehow you still expect to turn on the TV and see him grinning back at you. One thing is for sure though, I think it’s unlikely that the word “Bootiful” will be getting removed from the packaging for some time to come. 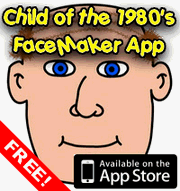 Stuck for a gift for a sweet toothed Eighties fan? 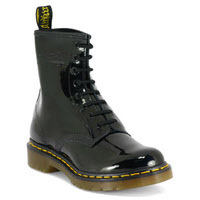 Here are a selection of items I’ve come across which might solve a Christmas present for you! 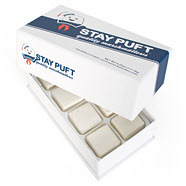 Firstly, I’ve made no secret of the fact that I’m a big fan of Ghostbusters, so you can imagine the massive grin that appeared on my face when I saw that Firebox are offering you the chance to buy your very own box of Stay Puft Marshmallows. They come in packs of 24 marshmallows, which are a decent size and certainly look delicious – all fluffy and cube like. For some bizarre reason they have also been caffeinated, so they should give you both a sugar rush and a caffeine wake up call! At a penny under 25 quid they aren’t cheap admittedly, but they do come in a nice presentation box featuring a picture of who else but Mr. Stay Puft the Marshmallow Man. If Marshmallows aren’t really your thing, perhaps jelly sweets are instead? Firebox have something for you too in the form of a Giant Gummi Bear! These really do have to be seen to be believed. 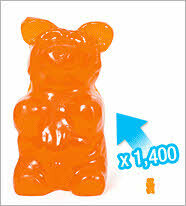 These big boys are equivalent to around 1400 regular sized Gummi Bears, and are no less than 24cm tall. They are available in cherry, blue raspberry, cola and orange flavours. Remember when your Mum used to tell you “don’t eat it all at once“? I think in this case that is probably sound advice. And if that is just too ridiculously big for you, then there’s a slightly more sane (only slightly) version coming in at 11cm tall which is also mounted on a stick, making it possibly a little easier to eat to boot. In my entire life I’m pretty sure I’ve only tried R White’s Lemonade a handful of times, yet if I was asked to name a manufacturer of lemonade I have no doubt it would be the R White’s name that I would mention first. I’ve really no idea whether R White’s is any better or worse than any other brand of lemonade (though I suspect it is one of the better ones) so why is it that the mention of lemonade instantly conjures up the R White’s name for me? Quite simply, it’s because of the TV advert for it. 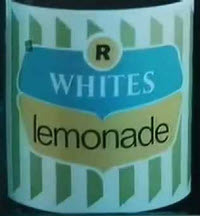 The “Secret Lemonade Drinker” ad was first used to advertise R White’s in 1973, and was used until 1984. It featured a man creeping downstairs in his pyjamas in the middle of the night to go and feed his addiction to a certain fizzy lemon flavoured beverage, all played out to a brilliant backing song, which starts off in hushed tones and ends up building to a rock ‘n’ roll crescendo, which wakes up his wife who comes down to investigate. The song was written and performed by Ross MacManus, with help from his teenage son Declan, who went on to change his name to Elvis Costello and have a successful music career! Competition Time! Rat on the Road DVDs to be Won! 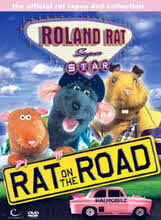 I recently reviewed the upcoming DVD release of Rat on the Road, the series which made Roland Rat truly a Superstar, hurtling him from introducing naff cartoons (although I have to say I did like Super Chicken – “you knew the job was dangerous when you took it Fred“) to being a mainstay (and indeed saviour) of TVam. I really enjoyed watching it and reliving a little bit of my childhood, and I’m pleased to announce that I have not one, not two, but three copies of the DVD to give away! Click on the following link to go to the competition entry page and you might be one of the lucky winners! 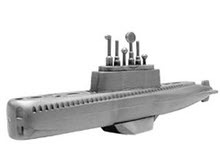 At first glance it was little more than a plastic submarine around 6cm in length, but open it up and fill the little compartment inside with baking powder, then pop it in a sink full of water, and the little submarine would astound you by repeatedly sinking to the bottom, then rising back to the surface, until it’s fuel load was depleted. Whilst it seemed magical, it was of course a fairly simple chemical reaction causing this behaviour. At first the sub is too heavy to be supported by the water, so it sinks to the bottom. The baking powder starts to react with the water and lets off a gas (carbon dioxide I believe), forming bubbles on the underside of the sub. These bubbles want to rise to the surface, so they carry the submarine back up, popping when they reach the surface and so the sub starts to drop again. These toys were initially produced in the 1950’s (funnily enough as breakfast cereal give aways) but I distinctly remember getting one out of a packet of some cereal or other when I was a kid during the Eighties. I believe there was also another variation on the theme given away, in the form of a little plastic SCUBA diver. If you are a fan of Eighties music then I have a great new band that you are bound to enjoy, particularly if you were into the synth pop stylings of bands like Depeche Mode or The Human League. They’re called Low Tide Theory, and their first track is called Crash. Now, I’ll come clean and say that the reason I found out about them is because one of their number is actually and old school friend, but even if that weren’t the case I would still be writing this as I really enjoyed listening to Crash. It felt so retro that I almost had trouble in believing the song wasn’t actually a product of the Eighties for real. Crash is their first track but they are busy preparing more audio delights for us, so why not pop over to their page on Reverb Nation or indeed the Low Tide Theory website (although at the time of writing this is still only in its early stages) to have a listen and find out more. Back in the early Eighties Britons looked on enviously at the the US with their huge range of TV channels, whilst we had a paltry three. Not only did the Americans have far more channels but they also had this curious idea of having actual TV programmes shown in the early hours of the morning. We just had test cards and pages from Ceefax. In 1983 things changed, and we were treated to breakfast TV. First the BBC started with Breakfast Time, and soon after ITV followed suit with TV-am. The BBC took the lions share of the viewers, and poor old TV-am limped along, ratings dropping lower each day. What could save them? A puppet Rat perhaps? Nah, surely not. Well, yes it did. Roland Rat Superstar was initially created to introduce some cartoons for the kids during the normal running of the TV-am programming, but in Summer 1983, with just a pink Ford Anglia and a meagre budget, Roland became a bit of a legend. During the summer holidays Roland and his gerbil chum Kevin were given half an hour to entertain the kiddies, and in so doing stopped TV-am from going under. History lesson out of the way then, I’m pleased to announce that Rat On The Road, that first true slice of Roland at his best, is to be released on DVD on November 15th 2010, and I’ve had the pleasure of taking a sneak look at the disc before release. The memories came flooding back! The main part of the disc is a condensed version of those first Rat On The Road shows. The original format was that Roland and Kevin travelled to different parts of the country every week, exploring different aspects of the chosen city each day. This disc takes some of the highlights of the series, and splices them together with Roland, Kevin and Errol the Welsh hamster (who ironically doesn’t get to visit Cardiff at the beginning of the series), reading extracts from Roland’s diary of the trip.